It is possible then to consider the degree to which each of these dimensions is present in a course, viagra 60mg using a percentage scale. This can be done at course level, try at block level (where a block might present a semester) or for individual weeks. So in the example below the course is divided into three blocks. 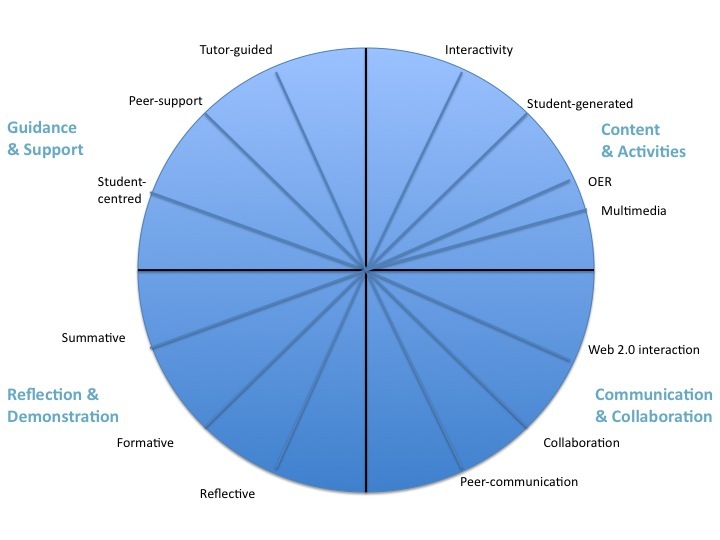 Block one has 65% interactivity (35% non-interactive), 10% of the materials generated by students (90% made available via the tutor), 20% of the materials are OER (80% from the tutor) and 75% multi-media (25% print-based). The table can then be represented either as a bar chart or a spider diagram. Alternatively these dimensions can also be used to give a balance across the categories. 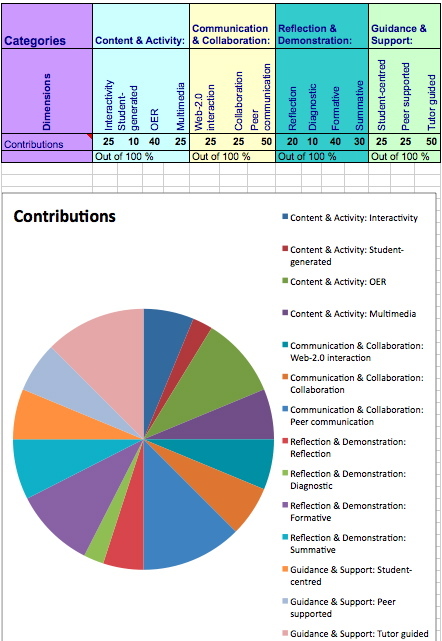 So in the figure below for example; in terms the Content and Activity category breakdown as 25% interactive material, 10% Student-generated content, 40% OER and 25% multimedia. This can then be represented as a bar chart. As part of our Course Business Models and Learning Design work we have been developing a range of representations (or views) for courses. I blogged about aspects of this back in June (http://e4innovation.com/?p=328) and there is also a cloudscape (http://cloudworks.ac.uk/index.php/cloud/view/1486). More recently I have had a paper accepted as part of a symposium at the Networked Learning conference that details some of the conceptual thinking. The representations range from views that are useful at the micro-level (such as individual learning activities), viagra cheap through meso-level (i.e. 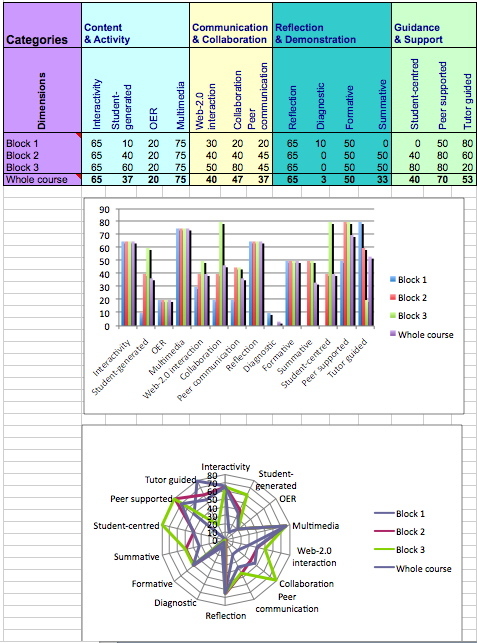 looking at a block of learning) up to whole course or programme level (macro-level). As part of this work Mick Jones and I had come up with a course map view some time back, generic which was based around 5 facets of a course. The categories were Guidance and Support, tadalafil Information and Experience, Communication and Interaction, Thinking and Reflection and Evidence and Demonstration. It seemed to work reasonably well but wasn’t perfect…. In parallel Niall Sclater, Barabara Poniatowska, Liz Burton-Pye and others in the Learning Innovation Office, as part of their development of a learning systems roadmap, had come up with a set of categories, which were tantalising close but not quite the same. For a long time we couldn’t see a way of reconciling this, but this week we had a breakthrough and I feel we now have a much better course view. Essentially we have distilled our five categories into four: Guidance and Support, Content and Activity, Communication and Collaboration, and Reflection and Demonstration. For Niall and his team there are two additional categories needed when taking a broader systems approach, namely Experience (i.e. all the factors that impinge on the students experience of taking their course and using the learning systems – i.e. accessibility, usability, personalisation, etc.) and Management (i.e. all the factors around managing and monitoring the learning process). The course view can also be used to generate a type of ‘spider diagram’ of the course. For each of the four categories it is possible to think of a set of dimensions and for each of these to consider them as a sliding scale from 0 – 100%. For example for Content and Activities there are four obvious dimensions – the degree of interactivity, the balance of course-team generated vs. student-generated content, the amount of Open Educational Resources included and the balance of paper-based vs. multimedia content. 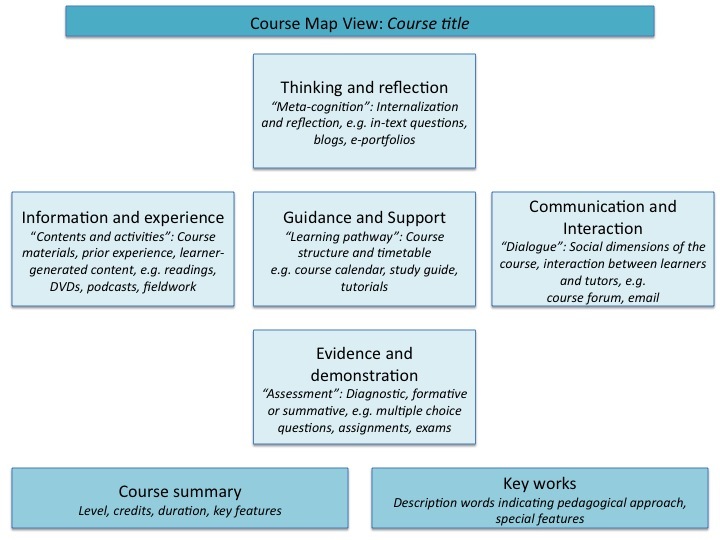 This spider diagram can be used when designing a course to make decisions about these different aspects or as a way of checking and comparing existing courses. The nice thing about this view is that it is also possible to have user-generated dimensions – for example you might imagine a Science course wanting to put in something to indicate the balance of theoretical versus practical lab work, or a professional course wanting a dimension on the amount of work-based activities there are in the course. So we are beginning to think about refining a set of core generic dimensions, along with some faculty-specific ones. This is very much fresh off the page thinking, so would really welcome thoughts! 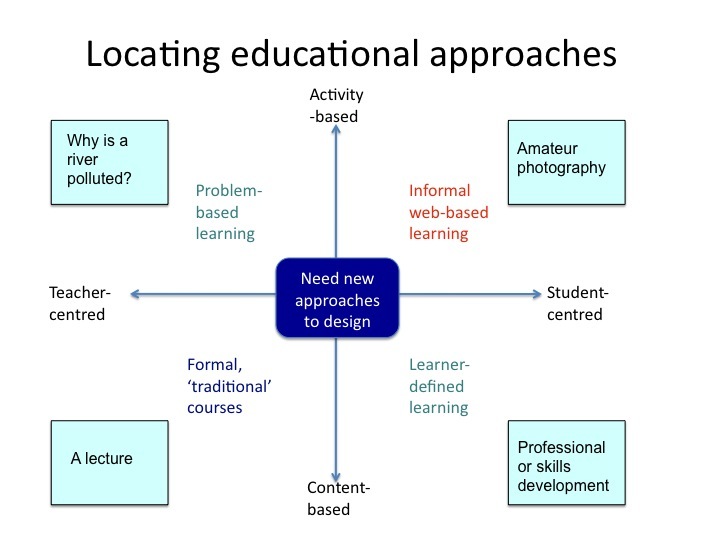 One of the things I talked about at the CODE International Symposium in Japan last week was a framework for locating educational practices. The framework has two dimensions: teacher-centered vs. student-centred learning (i.e. where the locus of control is for the learning process) and content-based vs. activity-based learning. I then showed how this could be used to map different types of learning across formal, cheap non-formal and informal learning context. So in the lower left hand side fairly didactic approaches, such as a traditional lecture presentation are located. Here the control is very much teacher-centred and the main learning is via delivery of content. Adopting more activity-based approaches, but still within formal educational contexts, shifts to the upper left hand quadrant – i.e. approaches such as problem-based, case-based, scenario-based or inquiry learning. The teacher is usually still controlling the learning process and here the focus is around some specific context and is primarily activity-based in nature. The bottom right hand quadrant considers approaches that are content focused but student controlled. A lot of Continuing Professional Development (CPD) or skills-based vocational learning fit within this space. Finally, informal learning approaches which are based around activities and engagement with others such as for example amateur photography, just-in-time language learning, gardening etc. fit in the top right hand quadrant.Of course these are extremes, specific instantiations of these different approaches to learning will shift – a lecture might actually have some degree of activity or might be more student focussed, nonetheless it is useful I think to consider these different approaches along these two dimensions, particularly as much of the rhetoric around the use of new technologies suggests a shift towards learner,-centred/activity-based learning - would welcome thoughts! You are currently browsing the e4innovation weblog archives for February, 2010.